← This is Plant a Row for the Hungry Week! We aren’t recording our harvest yields for any of our gardens this year, since we aren’t doing a Family of 4 Garden. However, just for today, I did weigh out our produce. 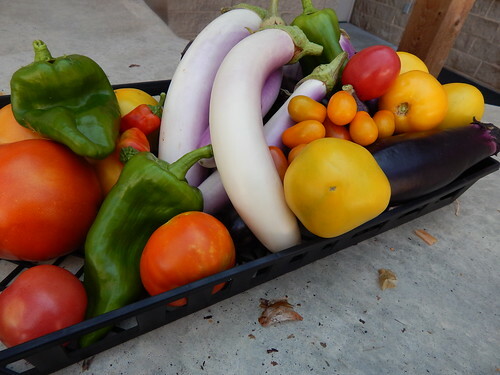 We had 5.25 pounds of eggplant, 4.25 pounds of tomatoes, 1 lb of peppers and onions, and 1 lb of green beans for a total of 11.5 pounds of veggies! All of our produce this week was taken to one of the drop off locations for the Plant a Row for the Hungry Program, since it is Plant a Row for the Hungry Week! Posted on July 9, 2013, in Harvesting & Eating and tagged beans, eggplant, peppers, Tomatoes. Bookmark the permalink. Leave a comment.